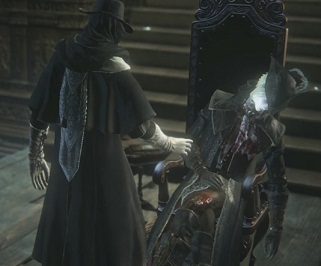 In Bloodborne: The Old Hunters, you will encounter Lady Maria of the Astral Clocktower as the third opponent in the course of the expansion. She is also a hunter and carries two swords in battle. She can merge them into a kind of spear if necessary. Occasionally she also uses her gun, which has a very broad reach. So you should avoid standing in a straight line to her. Phase 1: The first 25% of her health runs from the fight as an ordinary fighter duel. Lady Maria is incredibly fast and attacks you with quick thrusts and blows of the sword. Keep to the left side for a few quick hits and then recede again. From 75% life energy she uses the ability Hunter's Bone, which allows her, during evasive maneuvers, to become invisible. You may be now able to attack her with a fast gun to inflict a crushing attack and considerable damage by R1. Phase 2: From 50% health Lady Maria pierce with her sword and goes into a kind of rage mode, which enables her to use her blood as a weapon. She also gets a new Move-Set. Your attacks gain through the blood to reach and she try from time to time to jump on you, what flows from blood in an explosion. Her attacks also extend over the entire length of the battle area. You should continue to try to engage in the left side. In addition, she can still stun by pistol shots. Phase 3: At 25% remaining life energy she lights her blood attacks in addition to fire and also adds explosive damage. Parry supervisor you should abstain and instead focus on Molotov cocktails, causing considerable damage. Otherwise, you can only try to quickly heal and to set the final fatal blows in melee damage.